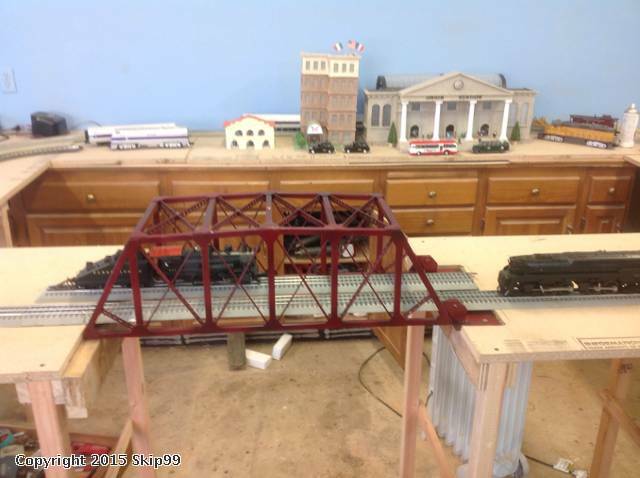 This bridge was made by my son it is made all out of steel. Skip that's really cool. How did he make it? Welded together? Custom, by hand? Did he use forms? Nicely done, sort of tin-plate style, art-deco. Are the end supports also steel, or are those plastic or wood? The ends are foam it weighs about 20 lb. it was done all by hand no forms. Looks like he knew what he was doing! A good looking bridge. How are the tracks supported? That's often a difficult part of the design.